Tickets are available by clicking the link above, by calling (866) 300-8300, or in person at the Tickets300 box office (302 N. University Drive; open 10 a.m. to 6 p.m. Monday-Friday), Fargo Brewing Company Taproom (610 N University Drive*), and Fargo Brewing Ale House (4445 17th Avenue S*). *Hours vary by day, please visit FargoBrewing.com. Singer-songwriter Matisyahu has been on journey inward for more than a decade. The journey has been private and public. The journey has at times been explicitly external, even while being driven by internal change. 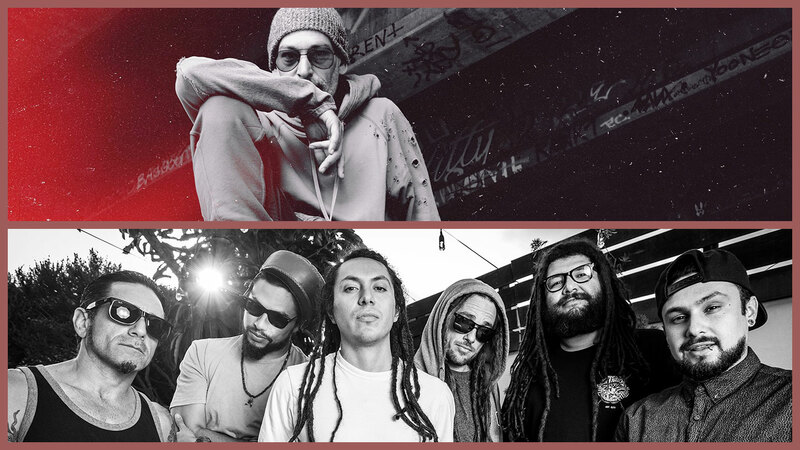 Now nearly thirteen years after the release of his first studio record, Matisyahu and his band have done something unmatched in his past repertoire; they have crafted that journey into a musically thematic eight song movement. The band features longtime guitarist Aaron Dugan, Dub Trio bassist and drummer Stu Brooks and Joe Tomino, and keyboard virtuoso BigYuki — and the journey starts with them. The band improvised for hours in the studio with Matisyahu watching on as an admirer without singing a single lyric. Out of the improvisations grew melodic themes, rhythmic peaks and valleys, blissful and proto-song guitar passages, deep dub meditations and ultimately an inspired instrumental record until itself. Only once the band had crafted this musical narrative, did Matisyahu begin to work on a lyrical narrative of his own — a lyrical narrative that is simultaneously informed and integrated with the music yet driven by Matisyahu’s own personal journey. The result is Undercurrent, Matisyahu’s sixth studio album. The record is musically Matisyahu’s most courageous release to date and lyrically his most vulnerable. The courage in the music comes from trust. Trust in the band. And only in the band. There are no post-production bells and whistles or litany of special guests on Undercurrent. On the opening track, “Step Out into the Light” the band lays out a repetitive minimalist verse section that anchors the listener in a near meditative loop only to open up into a gorgeous set of chord changes that makes the chorus feel revelatory, as if the listener has earned this release, and can achieve the song-title’s call to action. By the record’s third track, “Coming Up Empty” the band has established melodic themes that will be called upon or re-harmonized later in the record, and just two songs in, it is clear that these musicians are road-tested, brave-song-crafters, with tens-of-thousands of hours of playing together embedded in their muscles and fortified in their bones. The vulnerability in the lyrics comes from acceptance. Acceptance in uncertainly. Acceptance in the actions of one’s younger self and acceptance that while the future may be uncertain, having the courage to trust gives us all the best chance at meaningful relationships. It’s a lyrical reframing of the Jewish philosophical differences between emunah (faith) and bitachon (trust). Faith, the constant, and trust the immediate. Matisyahu sets the stage for this conceptually on the record’s opening track, but he digs in internally on the authoritative plea in the chorus of “Back to the Old,” [I’m giving up, I’m giving in / All I got is what’s right in front of me / Is the people that I see…]. He projects it outwardly through questioning in “Forest of Faith,” [What’s a man got to do, Oh! / To get through to you?] And finally works towards acceptance on the guitar-driven gem “Headright, [And I know feelings come and go / How should hold on, should I let go]. These forces direct the journey of Undercurrent, and as the record progresses the music begins to open up into full band improvisations like a relationship becoming more trusting, willing to take chances, knowing there’s acceptance in the process. A stunning example of this is on the record’s fifth track “Tell Me.” If you stop the song at the three-and-a-half-minute mark, you have a great reggae-tinged pop tune that promises to make a hit radio single. The track however continues for another six-and-half-minutes, beginning with a beautifully re-harmonized keyboard reference to the song’s opening wordless vocal melody. From there the entire band begins to improvise. Each player speaking briefly but with purpose, adding slowly and deliberately to the conversation. Drums and bass falling in and out. Guitar and keyboards calling back and forth to each other. The listener can almost intuit the personalities of each musician. The musical conversation continues to build, each band member adding to the improvisation without playing on top of one another. Trust and respect. This is truly Matisyahu the band. Matisyahu the singer is patiently waiting for the band to direct the journey, and he joins back in with a near whisper as the rhythm section finds that incomparable dub groove Brooks and Tomino are famous for. The level of interplay between Matisyahu and his band mates on Undercurrent is unquestionable and requires multiple listens. Each repetition of a song reveals a guitar line from Dugan that elevates a vocal melody that only 15 years of experience together can achieve. Keyboard patterns from Yuki unrealized in a previous listen connect one song to another and the full band improvisations that climax with an impressive exploratory section on the record’s final track “Driftin'” achieve the rare feat of capturing a band’s live potential on a studio album. Ultimately, Undercurrent, is a fully realized concept album crafted by a band-of-brothers who have learned to hold a conversation that is both comforting and challenging at the same time. It plays like a revelatory session with a great psychotherapist. Like someone watching an ocean wave move chaotically towards the shore unaware of the undercurrent pulling mightily back in the opposite direction, Matisyahu and his band have achieved a musical retelling of the Matisyahu story that explores the forces within that inspire us all, challenge us all, break us down, lift us up, and yet are rarely obvious to the outside observer.